Commercial protocols of drug abuse testing have undergone considerable change over the recent years, to stay abreast of the relentless rise in the new substances that are being abused, alternative matrices, and market demands. Drug abuse test is a non-invasive technical analysis of biological samples such as blood, hair, urine, and others, to diagnose the presence of illegal, prescription drugs, or their metabolites. Among these urine testing is the most preferred sample type used for drugs of abuse testing. Drug testing offers a critical adjunct to clinical care and substance use. Drug testing is now increasingly being used by sports organizations, employers, forensic purposes, and several other applications. The surge in number of people who consume alcohol and illicit drugs such as marijuana, cocaine, and others, is one of the major drivers for the drug abuse testing market. In addition, technological advancements in drug screening/testing devices and stringent government regulations mandating drug screening boost the market growth. However, lack of awareness and consideration of drug testing as a breach of privacy rights in certain countries restrict the growth of the global drug abuse testing market. Emerging markets such as the Asia-Pacific and LAMEA, provide lucrative opportunities for the drug abuse testing market growth. Based on product & services, the drug abuse testing market is segmented into analyzers, rapid testing devices, consumables, and laboratory services. The consumables segment was the highest contributor to the market in 2017 and is anticipated to maintain its dominance throughout the forecast period. This was attributed to the increased use of consumables for drug abuse testing over the recent years. 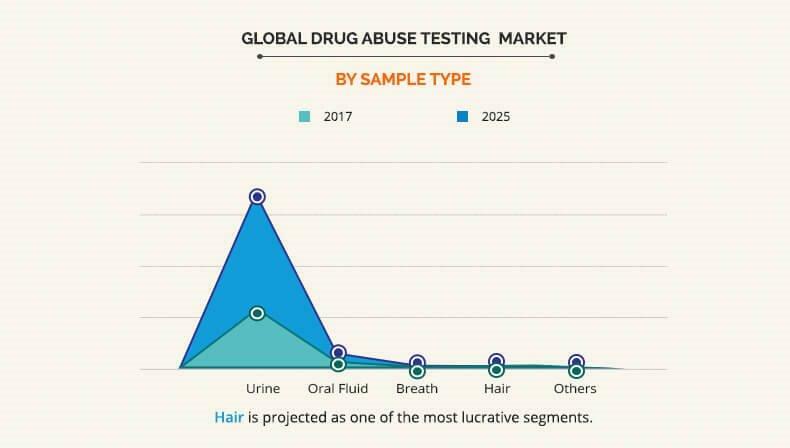 Based on sample type, the drug abuse testing market analysis is classified into urine, hair, oral fluid, breath, and others. The urine segment accounted for the highest revenue in 2017 and is expected to maintain its dominance throughout the forecast period. This is attributed to the lower price of urine sample analysis, availability in sufficient quantities, presence in higher concentrations of drugs of abuse and/or metabolites and availability of point of care tests. 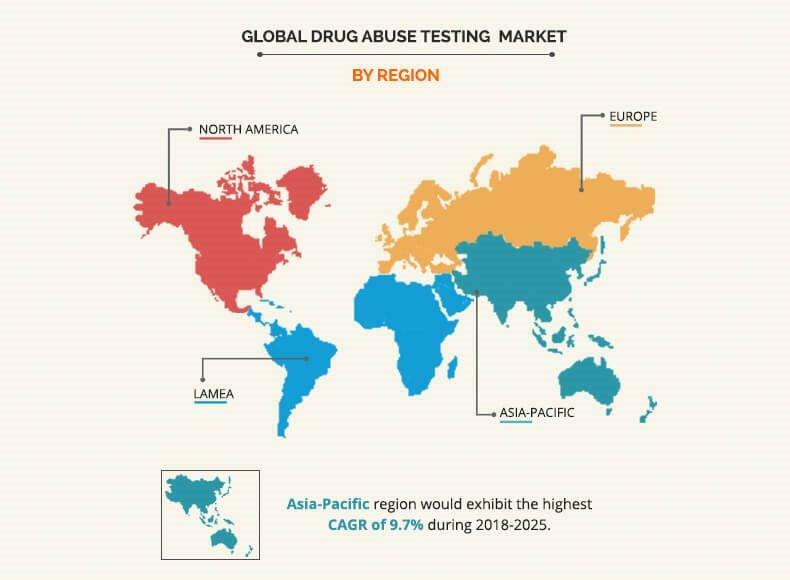 Based on region, the drug abuse testing market analysis is done across North America, Europe, Asia-Pacific, and LAMEA. North America dominated the market in 2017, accounting for the highest share, and is anticipated to maintain this trend throughout the forecast period. This is attributed to the rise in consumption of drugs of abuse in this region. However, Asia-Pacific is projected to register the highest growth rate from 2018 to 2025. The report provides a comprehensive analysis of the leading companies operating in the global market such as Drägerwerk AG & Co. KGAA, Abbott Laboratories, Hoffmann-La Roche AG, Biorad Laboratories, Inc., Siemens AG, Thermo Fisher Scientific, Inc., Danaher Corporation, Quest Diagnostics Incorporated, and Express Diagnostics International Inc. The other key players operating in the market include OraSure, Alfa Scientific Designs, Lifeloc, MPD, Inc., Premier Biotech, Shimadzu, Psychemedics, SureHire, CannAmm, and Omega Laboratories. The study provides an in-depth analysis of the global drug abuse testing industry along with the current trends and future estimations to elucidate the imminent investment pockets. A comprehensive quantitative analysis of the drug abuse testing market share is provided from 2018 to 2025 to assist stakeholders to capitalize on the prevailing market opportunities. An extensive analysis of the key segments of the industry helps understand the trends in the global drug abuse testing market. 8.5. EXPRESS DIAGNOSTICS INTERNATIONAL INC. The drug testing market is a fragmented market and is largely influenced by the growth in population of drug addicts. Based on the sample type, urine is the most widely tested biological matrix, without the need for venipuncture or potential infection at the site of injection. Whereas, hair sample segment is projected to grow at a higher CAGR when compared with other segments due to advantages offered by it including high resistance to evasion by adulterating or substituting samples and also provides wider window of detection. However, some countries have individual privacy protection rights, wherein drug abuse tests are considered as violations of an individual’s privacy. In addition, the most common drug test (urine test) that is used globally for its convenience, flexibility, and economical element can be manipulated to a certain extent, which can result in flawed conclusions. This could be a major hindrance for the growth of the drug screening market. Many key players have been working on rapid testing devices to avail the technology in the developing markets at reasonable costs. North America accounted for the highest market share and is estimated to continue the same during the forecast period. This is attributed to the presence of better medical facilities and ease of availability of the drug abuse testing devices. However, untapped regions such as Asia-Pacific, Africa, and Latin America, are estimated to emerge as lucrative markets, owing to the introduction of promising drug screening technology, growth in demand for the latest drug screening devices, and increase in disposable incomes.